June 13, 2006 -- AS Charlie Chan once put it, "Optimist only sees doughnut. Pessimist sees hole." Three years after the vintage movies about the globe-trotting Honolulu detective were pulled from TV, the Asian-American group that protested the showings as racially offensive now applauds a new DVD release of Chan's adventures. "If you put these movies in the context of their time, there are still issues but you can find things that are positive," says Stephen Gong, who became executive director of the Center for Asian Media in San Francisco earlier this year. Gong says he was pleased Fox Home Entertainment was including extensive interviews with Asian-American actors and historians discussing their mixed feelings about the films, which were produced from 1929 to 1949. While some are uncomfortable with Chan's trademark aphorisms and broken English, perhaps the biggest issue has been the portrayal of the ace Chinese-born crime-solver by Caucasian actors such as Warner Oland, a Swede who stars in four of the five movies in "The Charlie Chan Collection: Volume 1," out June 20. The films are considered historically important because Chan was Hollywood's first Asian-American hero - modeled by novelist Earl Derr Biggers on real-life Honolulu police inspector Chang Apana - at a time when actors then known as Orientals were invariably movie villains. "Once you get past the stereotypes, the movies do trace the changing position of the Chinese in America," Gong says. "Chan's children become Americanized, and Keye Luke [who plays Charlie's "No. 1 Son" Lee] is doing terrific work as an actor. He was a real pioneer in the Asian-American community." Steve Feldstein of Fox Home Entertainment says the Chan films were among the most requested unreleased movies in the Fox library. "We get letters and e-mails asking for them all the time," says Feldstein, who plans to release another set of films starring the Hungarian-Jewish actor Peter Lorre as the Japanese detective Mr. Moto in August. Movie buffs who accused the Fox Movie Channel (like Fox Home Entertainment and The Post, a unit of News Corp.) of bowing to extreme political correctness when it yanked the Chan movies in 2003 are eagerly awaiting the new DVDs, which include films released from 1931 to 1935. The titles are "Charlie Chan in London," "Charlie Chan in Paris," "Charlie Chan in Egypt" and "Charlie Chan in Shanghai," all with Oland - as well as "Eren Trece" ("There Were Thirteen"), a rare Spanish-language version of the lost "Charlie Chan Carries On," starring Manuel Arbo in the title role. "I understand some Asians' sensitivity about the films," says film historian Leonard Maltin. 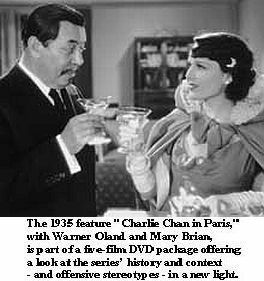 "But anyone who watches them can see that Charlie Chan is invariably the wisest - and kindest - person on the screen. That's the 'image' I take away from these movies."